As a city with an evolving presence in the sports industry, Atlanta has the opportunity to showcase its place in American history as a not just a major sports market but as a growing hub for business and entertainment. The city that hosted the 2017 College Football Championship game—with a successful weekend leading up the game—is slated to host the NCAA Final Four in 2020, but it’s the Super Bowl in 2019 that will prove the city’s mettle in terms of being a legitimate host city. With the development of the Georgia Aquarium, the growth of Centennial Park as an event venue, the College Football Hall of Fame becoming a major attraction and the Georgia World Congress Center redevelopments, the Atlanta Sports Council (ASC) went into the bid for the Super Bowl in May of 2016 with the theme of “Atlanta Transformed.” The ASC confirmed in early 2018 that they are working on their bid to host the World Cup in 2026, which is set to be played in North America. “The entertainment and infrastructure that we have to put on this event and all of the events around it…remember the Super Bowl is not just Super Bowl Sunday, it’s 10 days leading into the game,” Dan Corso, President of the Atlanta Sports Council, said. “We’ve got fan events both free and paid and with over 150 events associated with the event. “It’s 10 days of pure entertainment and sports coming together, and we’re certainly in a spot now compared to where we were in 2000 to be able to accommodate it because the event has grown significantly since our last hosting in 2000. Thankfully, our community and our infrastructure has continued to grow and evolve with it,” Corso said. Atlanta’s infrastructural growth hasn’t always benefited in the way of hosting major sporting events or being a significant player in that realm. In 1975, when Atlanta mayor Maynard Jackson and Coca-Cola CEO J. Paul Austin commissioned several business owners about bidding for the Olympic Games, the proposition was immediately shut down. It would then be over a decade before the city would revisit the issue. When Billy Payne, an attorney and former University of Georgia football player approached Mayor Jackson in 1987 about hosting the games, Jackson was doubly intrigued by the idea. According to historian and foremost expert on the city of Atlanta, Dr. Maurice Hobson, the twosome of Jackson and Payne led the Georgia Amateur Athletic Coalition [sic] which gave Atlanta room to host 40 major events in the city. This was followed by the commissioning of the Atlanta Committee for the Olympic Games. However, there were still questions about Atlanta’s infrastructural ability to host such a global event. This question was put to the test when the city hosted the Democratic National Convention in 1988 at the Omni Hotel. After receiving the bid in 1990 to host the Olympic Games, Atlanta had ample time to prepare to cater to such a grand event. And even in the years after the games, Atlanta sports has benefitted from those games. The growth of the downtown area including Centennial Olympic Park and then-Turner Field can be traced back to the Olympics. Panthers’ football has a somewhat bright future because of its physical and metaphysical place in Atlanta history. The team now plays in the old Turner Field, mere yards away from where Atlanta-Fulton County Stadium stood, where Hank Aaron hit his 715th career home run in 1974. Georgia State’s stature on and off the field will only grow alongside its relationship with the city, allowing its place in sports culture to expand. What Atlanta now has going for itself is the plethora of venues that can actually host significant games. Atlanta’s sports market has bolstered with downtown area attractions. Corso refers to Atlanta’s “places to play” to “places to stay” as part of the major attraction that allows for the city to garner attention for major sporting events like the Super Bowl and the College Football Championship. The hotel rooms, restaurants and entertainment options available that are walking distance from the major venues are a massive plus for Atlanta’s industrial area. “It’s the connection center space, it’s restaurants, it’s private party areas, it’s private spaces and things of that nature. 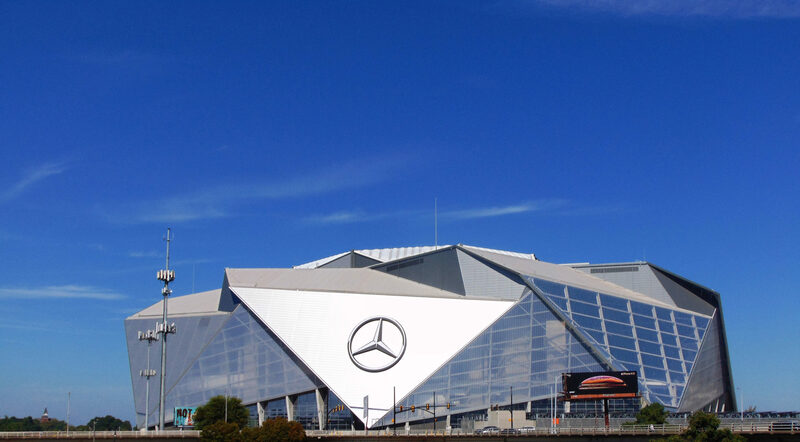 Then it’s the fan attractions like the Hall of Fame, and the World of Coke and the Aquarium, and the [Georgia World Congress Center], places where those private events and public events can be held as well,” Corso said. “You have to have the venues and the hotels, but then you also need to have experience, and you have to have people involved that work well together, which we do here in Atlanta. “All of those organizations are very collaborative and work very closely together including the Atlanta Sports Council and when it comes to putting all of these events on we all work very closely together to make it the best possible event that it can be. The idea is that we want to get it back, we want to be in the regular rotation with these big events to keep coming back to our city, so we got to make sure it goes very well when we have it each time,” Corso said. According to Dr. Hobson, from 1990 to 2000 the city of Atlanta grew by 22,000 people. In that same time, the city was “franchising itself for world consumption.” This marketing of the city for its lauded inclusivity and business acumen allowed for Atlanta to host Super Bowl XXXIV in 2000. By 2019, the city will have three brand new venues to hold sporting events. Take one look at the renderings of State Farm Arena, previously Philips Arena, and there is a clear picture of what Atlanta is all about.